Brighten and refresh your skin with the Nesti Dante Il Frutteto Citrus & Bergamot Soap, a vegetable-based cleansing bar. With a cascade of energising Citrus extracts cultivated from a Florentine orchard, the soap works to revive and invigorate both the body and the mind. This makes the Citrus & Bergamot Soap the perfect early-morning cleaner thanks to its awakening scent and a deeply cleansing lather. Work into a thick lather on damp skin, and then rinse away. Shipping Restriction: Please note that at the request of Nesti Dante we are not able to ship this product to the USA. 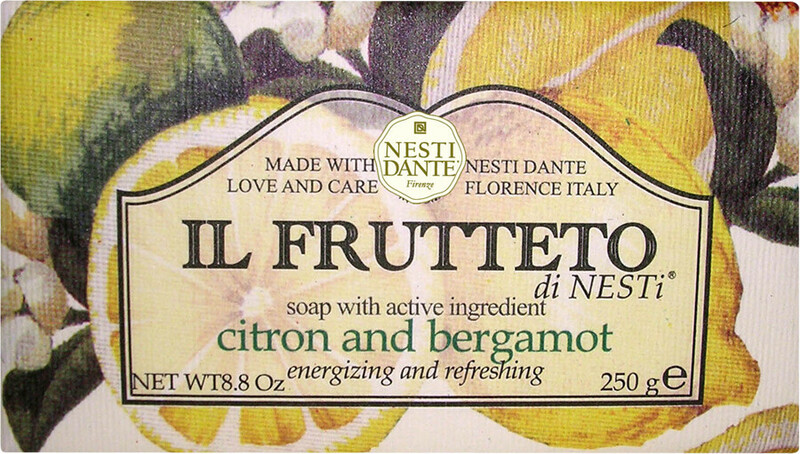 Nesti Dante Il Frutteto Citron and Bergamot Soap 250g is rated 4.3 out of 5 by 3. Rated 5 out of 5 by LizzieM from Yummmm! This soap is absolutley scrumptious. It smells amazing and doesnt dissappear down the plug hole when left in the shower!! Rated 4 out of 5 by Adria from Attractive packaging Thanks to its attractive packaging, the soap looks nice on a bathroom shelf. The bar is too big to handle easily and the smell doesn't last long after unwrapping the soap.